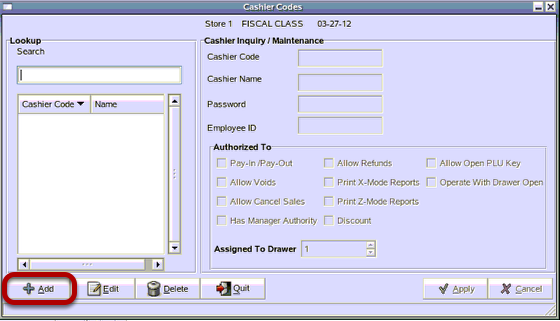 TravStar1 Point Of Sale SystemManager's Work Station Getting StartedHow Do I Setup a Cashier? This lesson will teach you how to setup a new cashier. 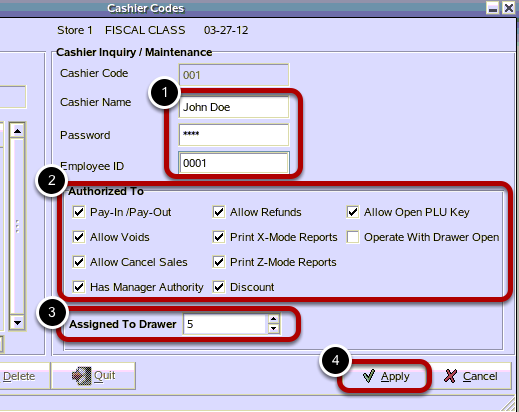 To add a new cashier, click on the "Add" button located at the bottom of the Cashier Codes Screen. At the Add New Cashier prompt, type in the new cashier's code number. Then, click on the "OK" button. The code number can be up to three digits. (1) Type in the Cashier Name. Type in 4 numbers for the cashier's password. Type in the Employee ID. 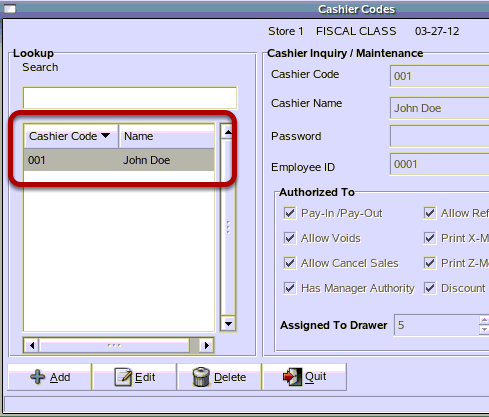 Note: The Employee ID field is used to link the cashier to the employee. If a cashier is also going to be clocking in and out on the register, the cashier's Employee ID number will need to be entered here. For additional information on setting up an employee please see How Do I Setup An Employee? (2) In the Authorized To section, check the boxes next to the permissions (See What Are Cashier permissions?) allowed for the cashier. (3) In the Assigned to Drawer section, enter 5. Now your new cashier shows up in the cashier lookup screen. 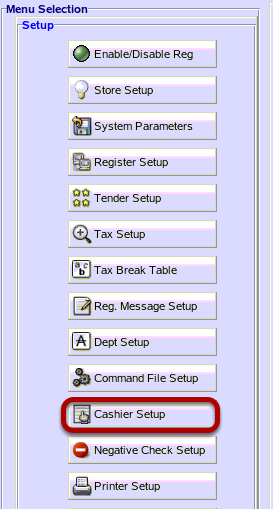 Prev: How Do I Navigate the Manager's Work Station? Next: How Do I Edit an Existing Cashier?